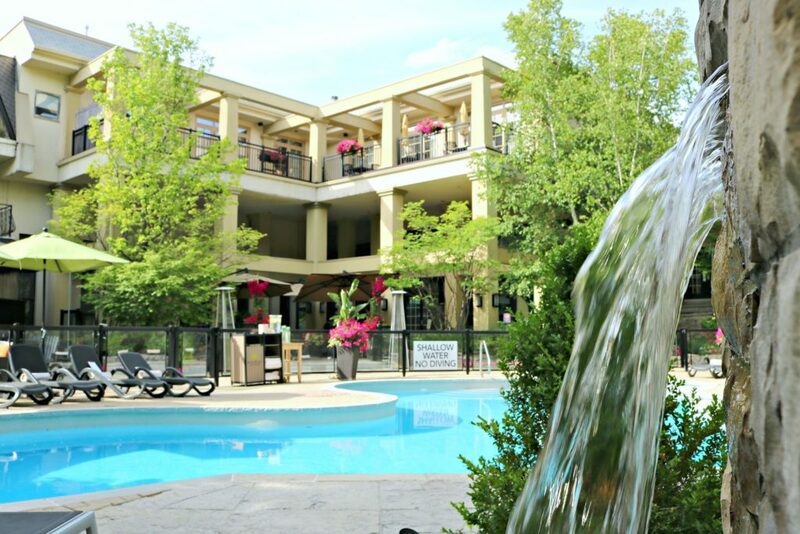 You are here: Home / Couples Travel / Why You Need to Get Away to Hockley Valley Resort Mid-Week! 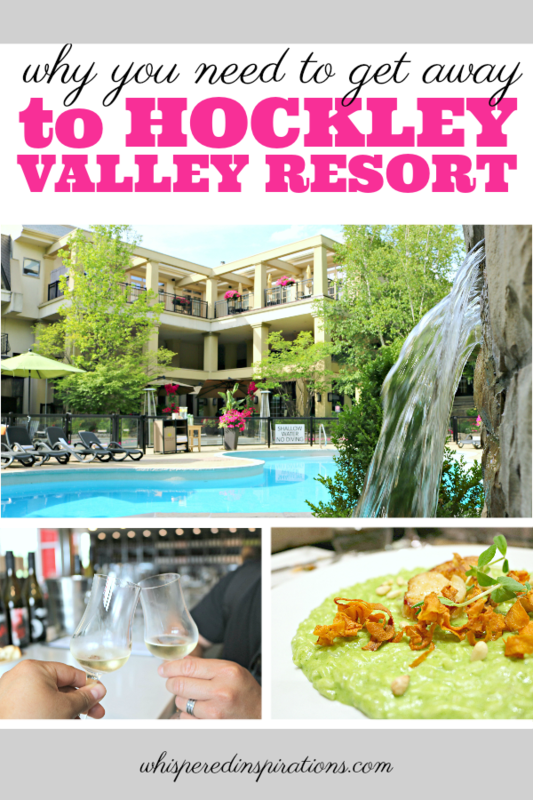 You Need to Get Away to Hockley Valley Resort Mid-Week! Summer is in full swing and that means life tends to get a bit busier. If you’re a parent, your kids are home from school and the weekends are booked for sports and other events. Even if you don’t have kids, it’s still tougher to book days off of work during the summer weekends. 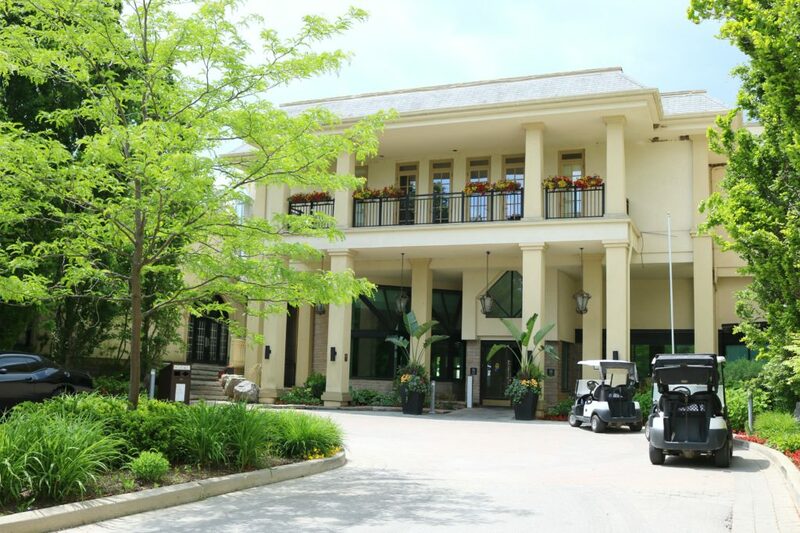 Instead, you should book a couple days off during the week and head over to Hockley Valley Resort. 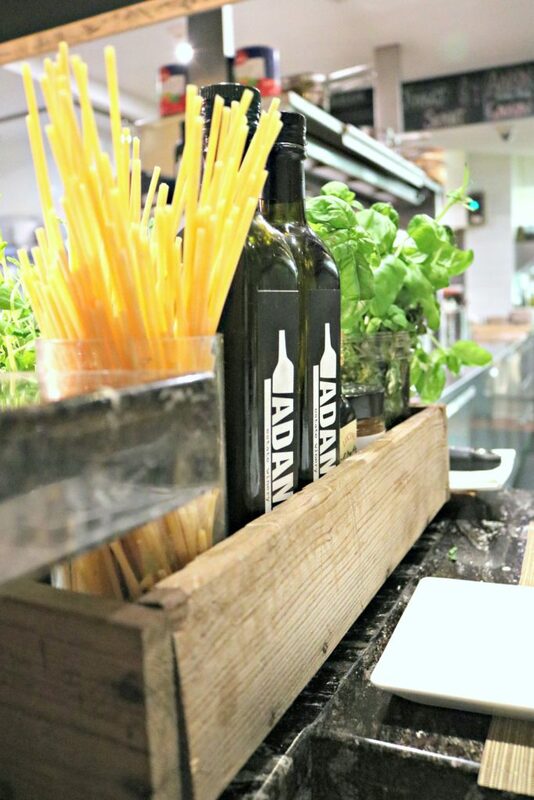 Prepare for R&R, spa treatments, delicious food at Hockley Valley Resort, and amazing wine at Adamo Estate Winery. The best part is that if you’re in Ontario, you don’t have to go far to tap into this beautiful paradise. It is so close! 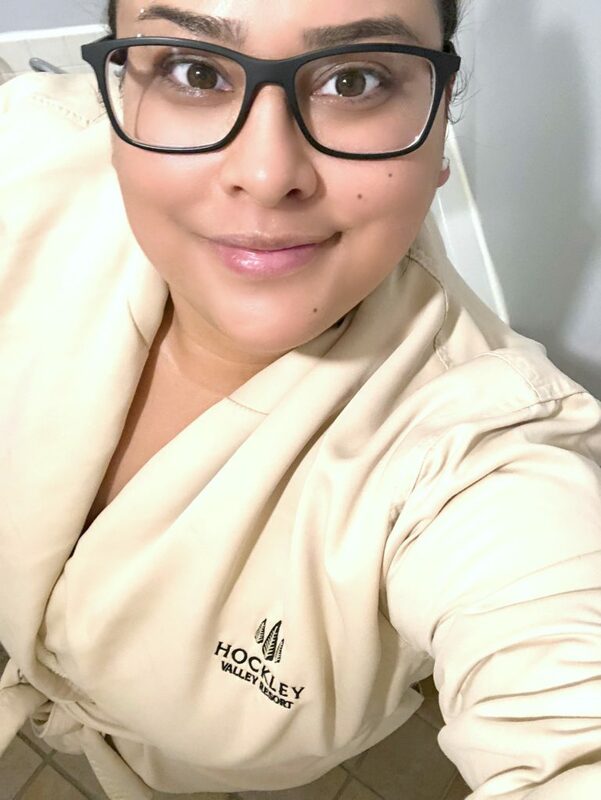 Read on to discover why you need to get away to Hockley Valley Resort mid-week, believe me, you will not regret it! 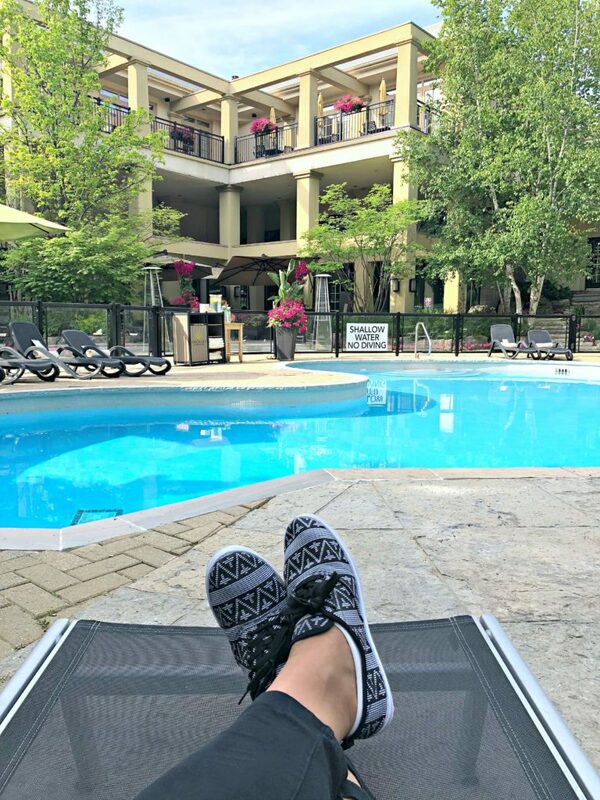 We love to travel often, recently Darasak and I were invited to Hockley Valley Resort to indulge in a little mid-week R&R. It was much welcomed because the end of the school year tends to be really stressful. 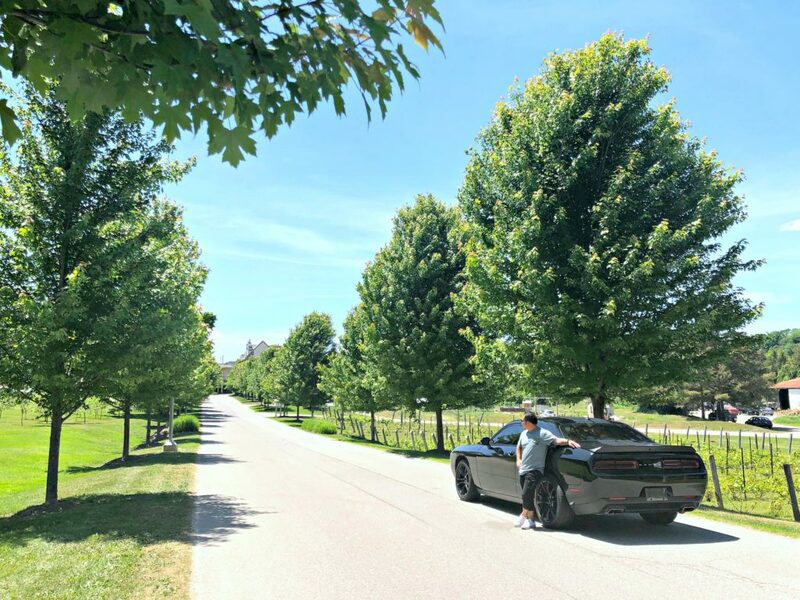 The plan was to enjoy the short drive up to Mono, ON and just enjoy being together as a couple. That is why we love road trips, they are just as delightful as the destination itself. We live in Windsor, the most southern point in Ontario. It only took us 3 hours and 50 minutes to get there. If you’re in the Toronto area, it’s even closer! The drive up was beautiful, we took our time and took in all the beautiful hills on the way there. Once we arrived, we had reservations for a delicious dinner at cabin restaurant. 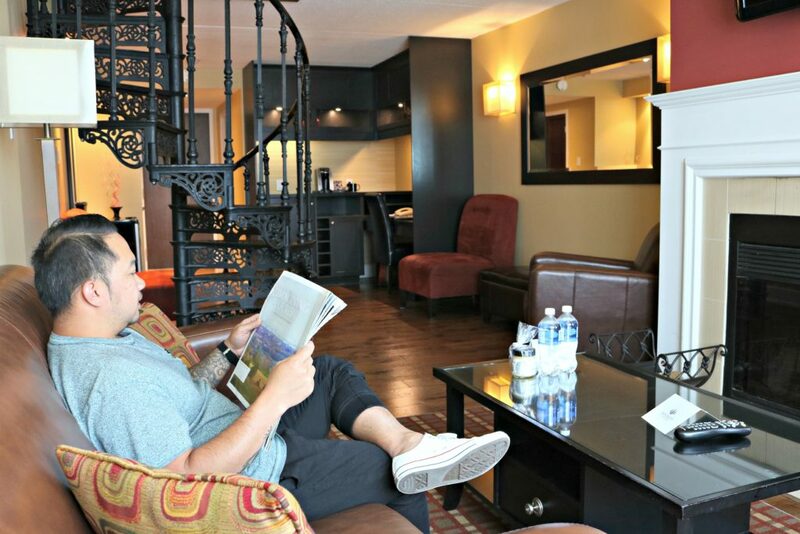 Afterward, the plan was to explore the grounds and get a good night’s rest in our gorgeous bi-level Regal suite. In the morning, a buffet breakfast and a spa facial awaited us. 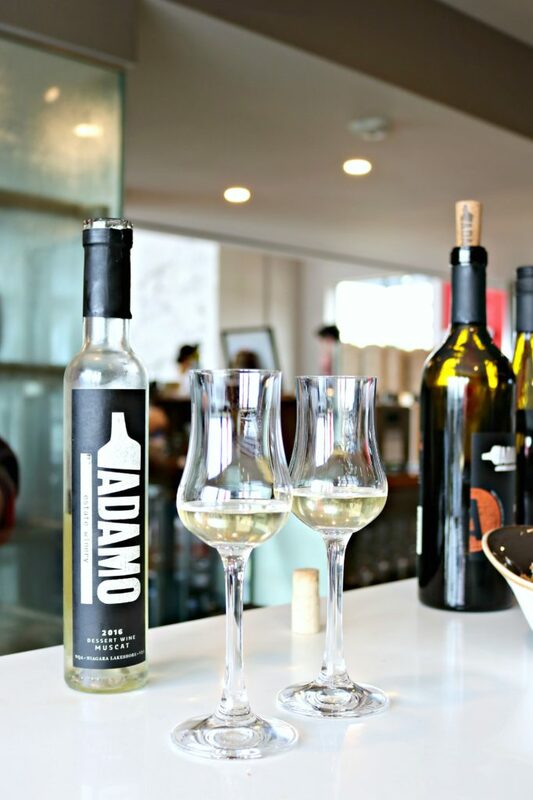 Then, a wine tour and tasting at Adamo Estate Winery was on the itinerary. Our Regal suite was incredible. If you’re looking to recharge your batteries, this is the way to do it. 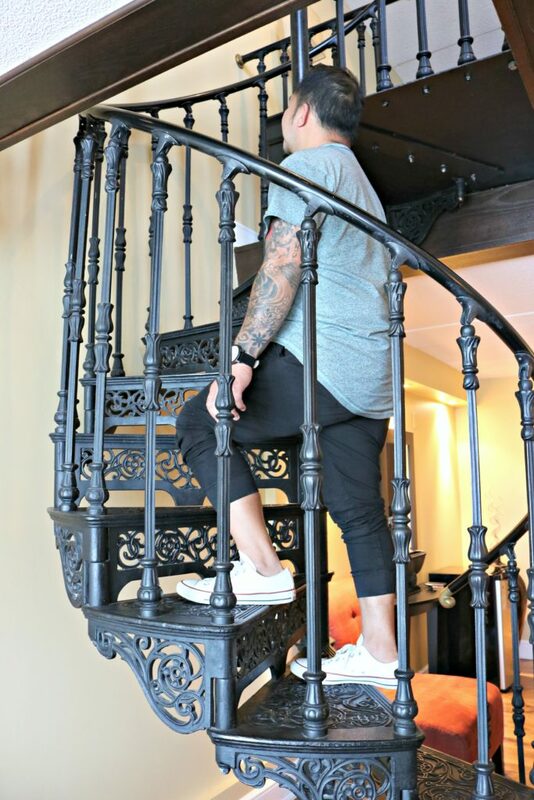 We had a bi-level Regal suite with a magnificent wrought iron spiral staircase. It led up to a king bed with a Jacuzzi tub and a gorgeous bathroom with a walk-in shower. The lower level has a fireplace and spacious sitting area. There is a small powder room with a shower. Plus, a small coffee station and desk. I set up my computer there to check on emails. Truth be told, I only looked once! What was one thing that was mind-blowing? Well, that fact that there are TWO balconies. One on the lower level and another where your bedroom is. The view is gorgeous during the day and evening. I love having a balcony when I travel because I like to go out to enjoy the breeze. Plus, seeing the Hockley Valley Resort from above is a sight to see. The food and dining experience at cabin is nothing short of spectacular. 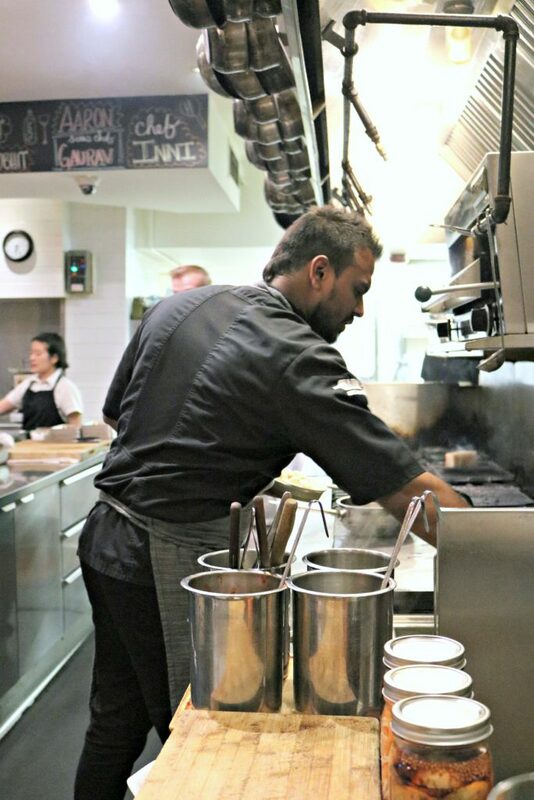 We were very lucky to be seated at the chef’s table and the chance to get to know Chef Inni. He told us that a lot of their produce is grown right in their garden. Whatever isn’t in season or cannot be grown on-site is bought from farms and producers within a 100-km radius. He prepared an off-menu appetizer for us. It was a handmade ravioli stuffed with ricotta, in a creamy pesto sauce, topped with 100km farm double smoked bacon. 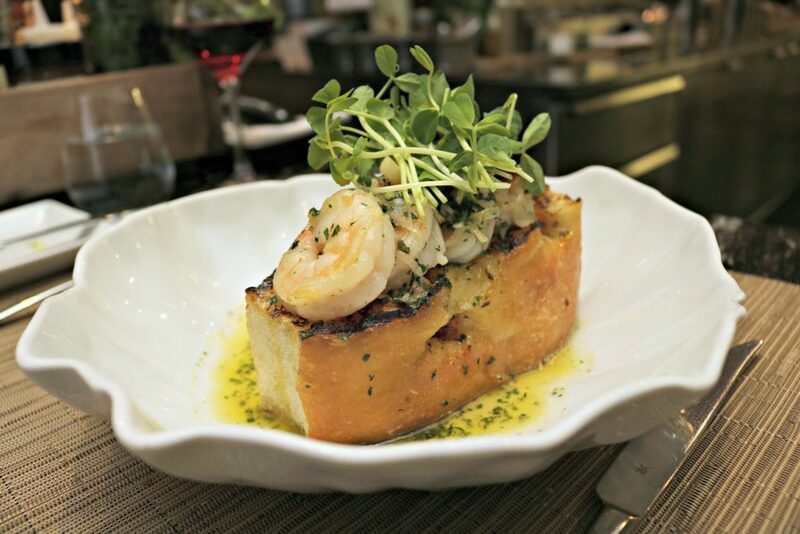 Then Darasak had a garlic toast topped with perfectly cooked shrimp, fresh herbs, and oils. I tried the Parmigiano truffle fries with truffle oil. 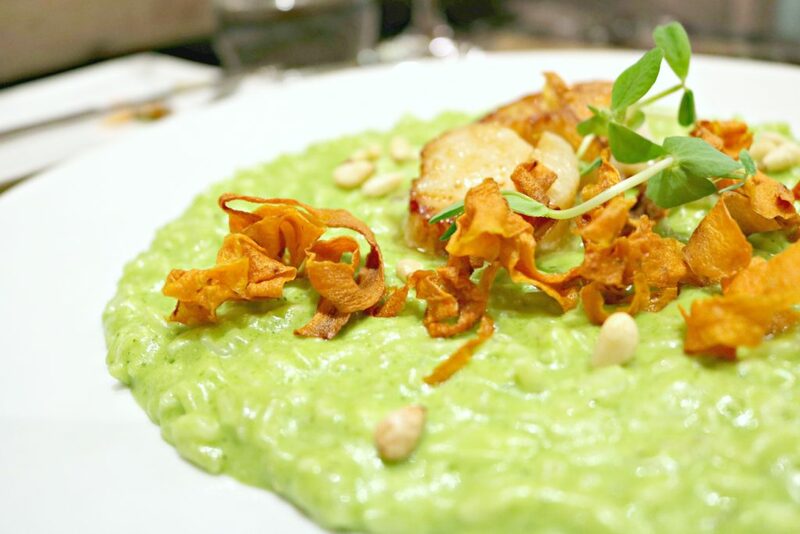 Darasak’s main dish was handmade risotto, topped with crispy carrots, pine nuts, scallops and fresh herbs. 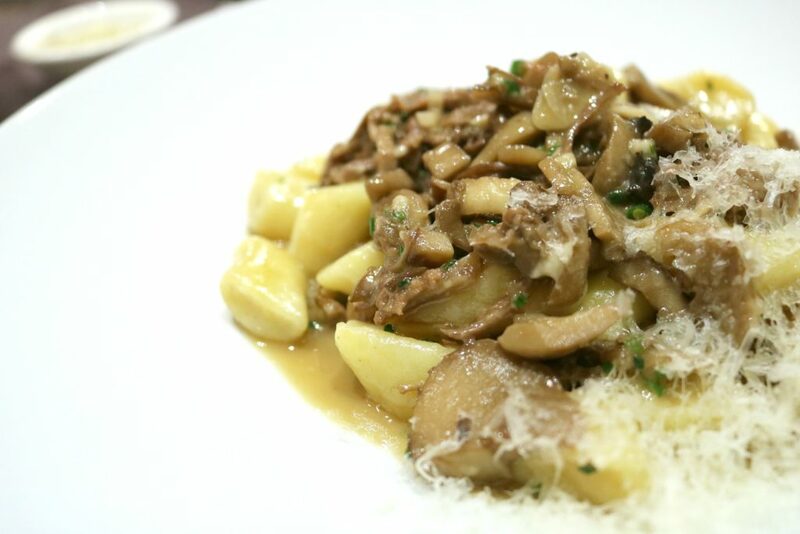 Mine was a delicious handmade ricotta gnocchi, topped with fresh mushrooms, pulled beef, and fresh parmesan. TIP: Make sure you make time to explore the grounds, it is beautifully landscaped. Visit their farm too! 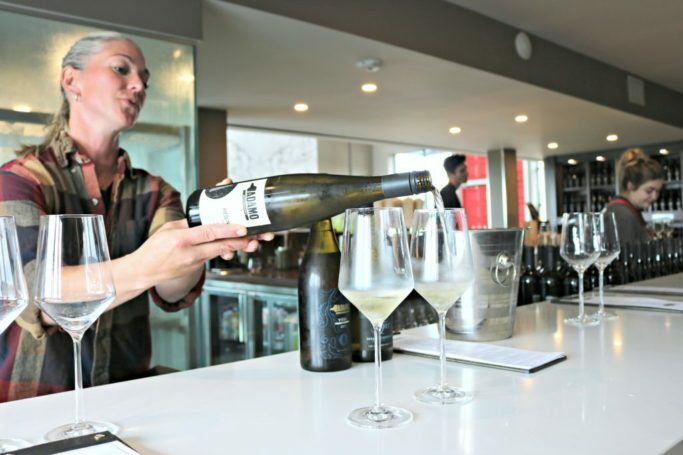 We sampled a glass of Adamo Estate Pinot noir and Riesling, as well as a few more delicious cocktails. 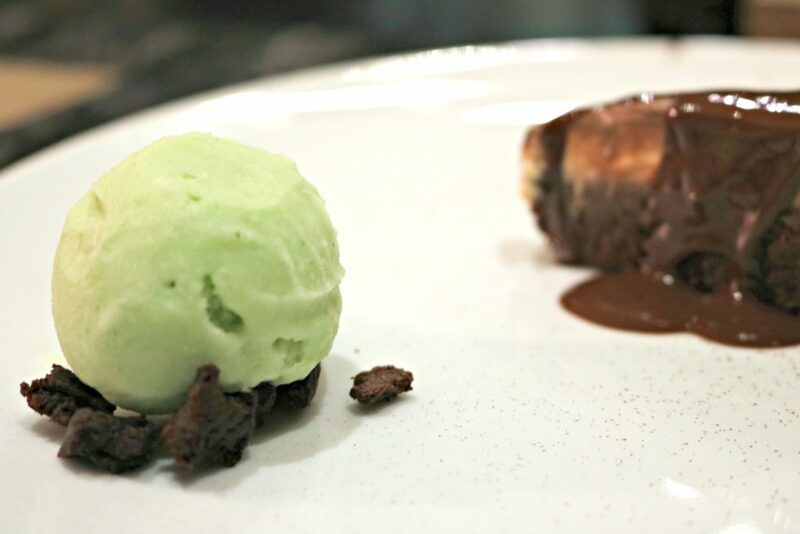 We ended the meal with a fresh palate cleanser–a coconut mint sorbet on a bed of gluten-free brownie. Plus, an incredibly creamy, gluten-free chocolate torta. The quality of the food was out of this world and it was an amazing experience to have the chef explain each dish. 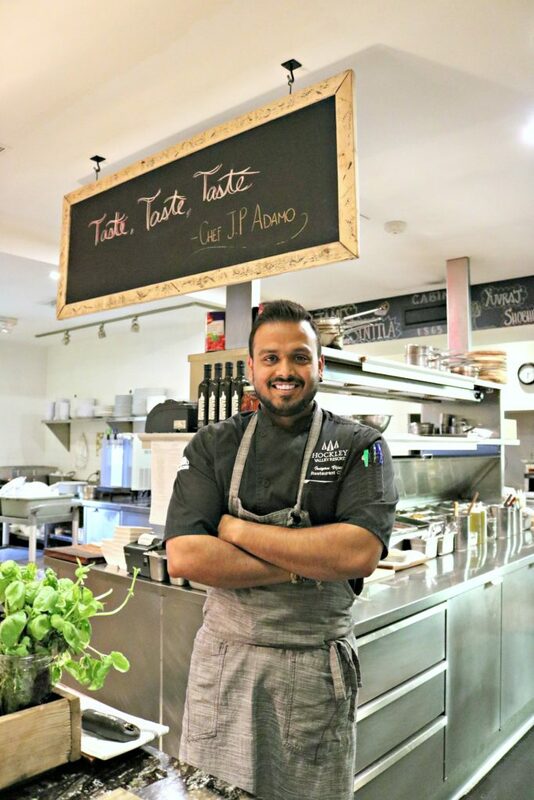 Chef Inni is a talent and his food shows it! 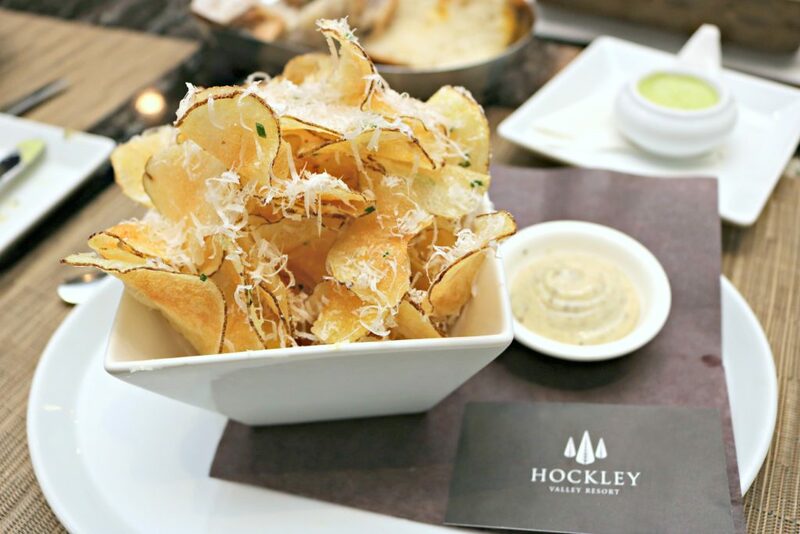 It’s a must if you come to Hockley Valley Resort. 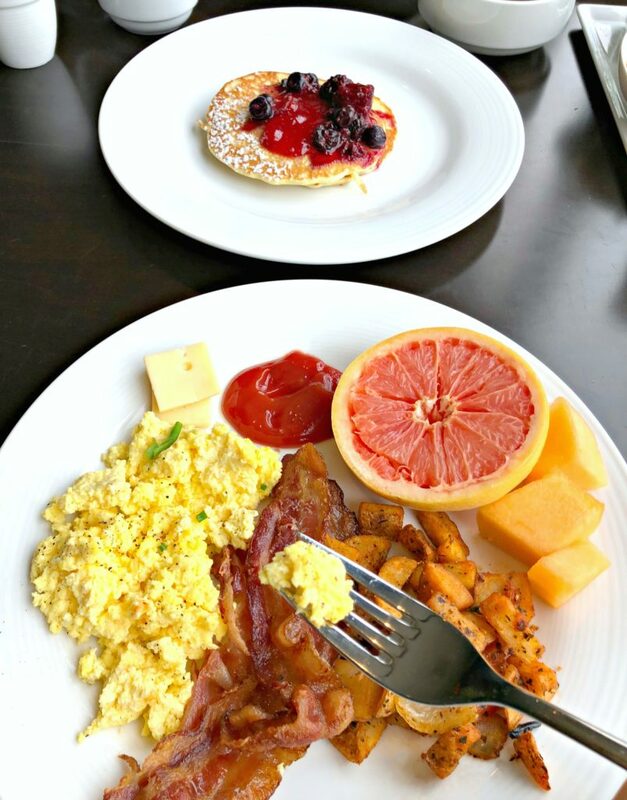 We started our day off with a delectable buffet breakfast. 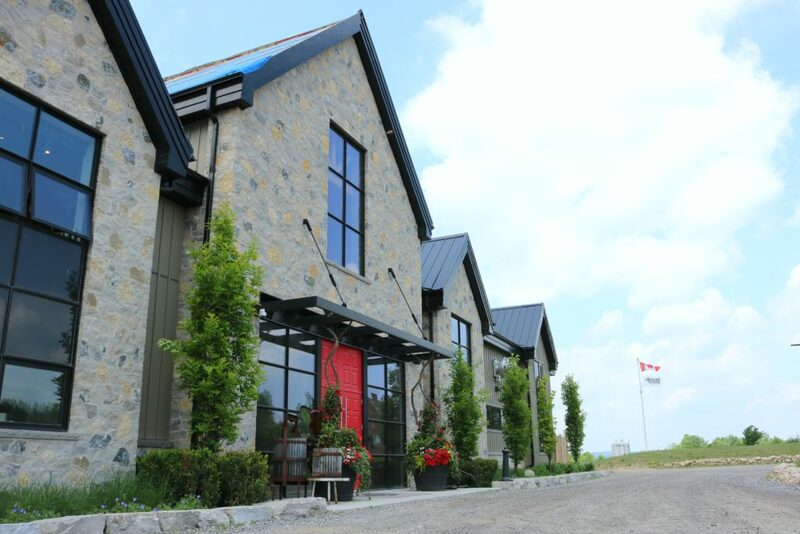 Then we headed to the Hockley Valley spa for our appointments. We expected to have a relaxing experience and we totally did. One thing we didn’t know was going to happen was that Darasak would become addicted to getting facials. So, that’s a score for me! We had the ‘Just for You’ facial and it was AWESOME. The staff was so knowledgeable, attentive, and made you feel comfortable. I’ve had many spa facials in my day and this one, by far, was one of the most comprehensive. I discovered so much about my skin and all the products they used were nourishing and delightful. It was so incredibly relaxing. In fact, the spa is one of the many reasons I definitely want to go back! 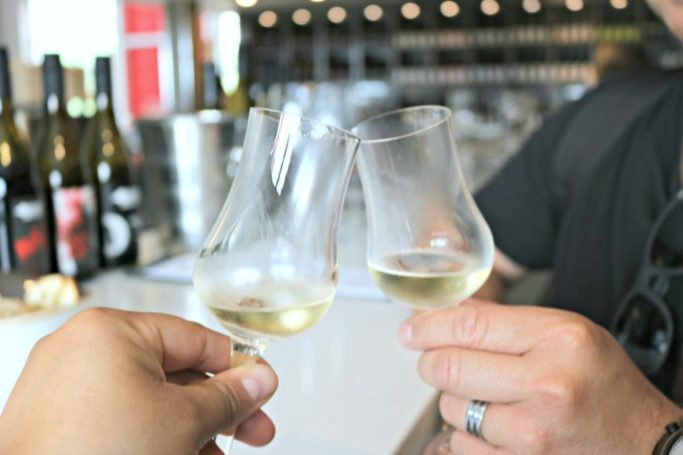 Once you step into the winery, you will notice how modern and stylish it is. 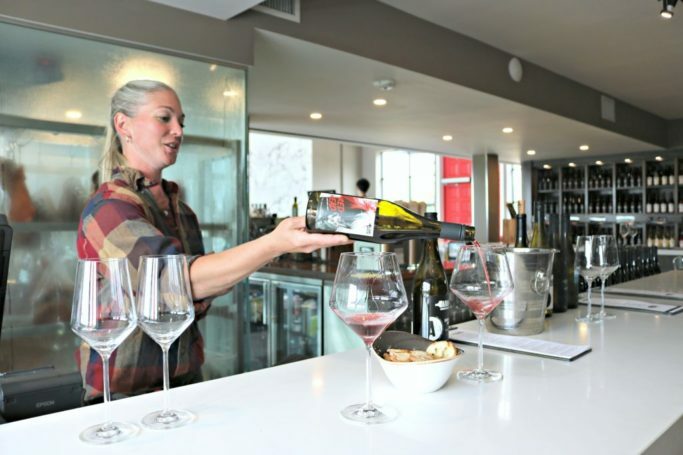 From the decor to the wine tasting bar, and even the outdoor patio. We met up with the winemaker, Shauna White, and she took us on a tour throughout the entire winery. 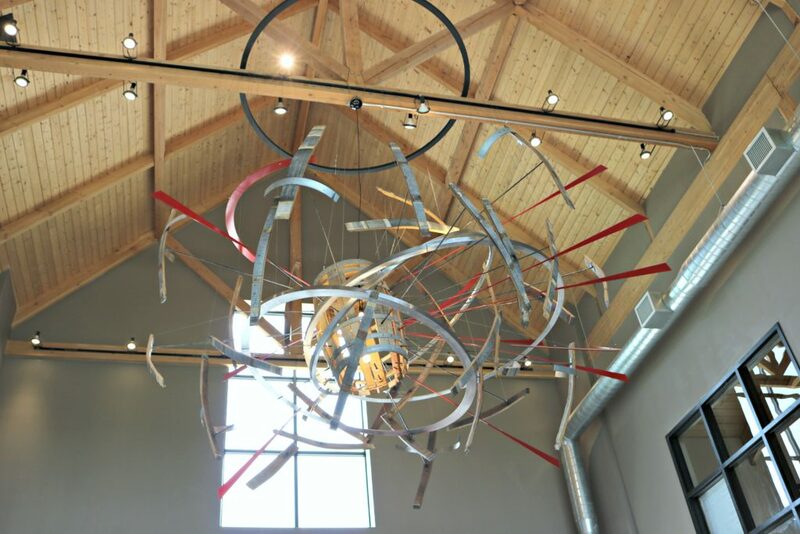 Right in the lobby, you’ll notice a very unique piece of art hanging as a chandelier. 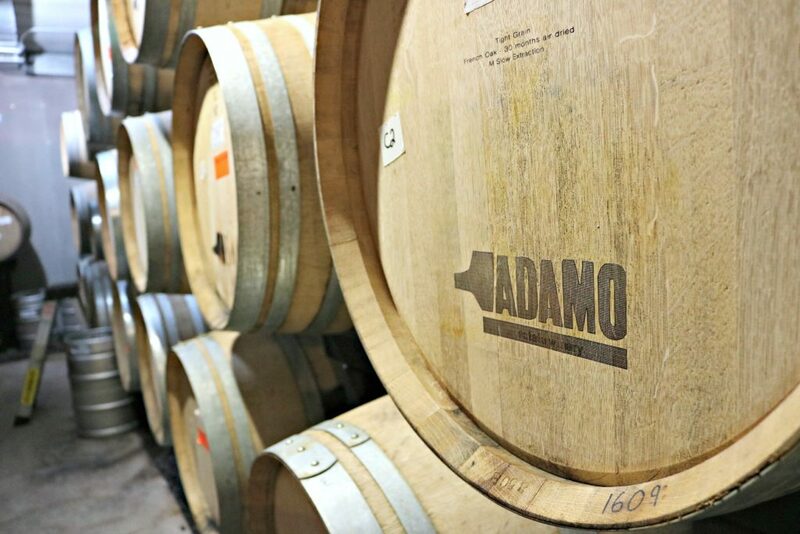 It is actually one of Adamo’s first wine barrels that was entrusted to a local artist to create. It’s a deconstructed barrel turned into a chandelier and man, it’s so beautiful. They also have a boardroom (the Tank Room) and a hall (the Great Room) that can be booked for special events. 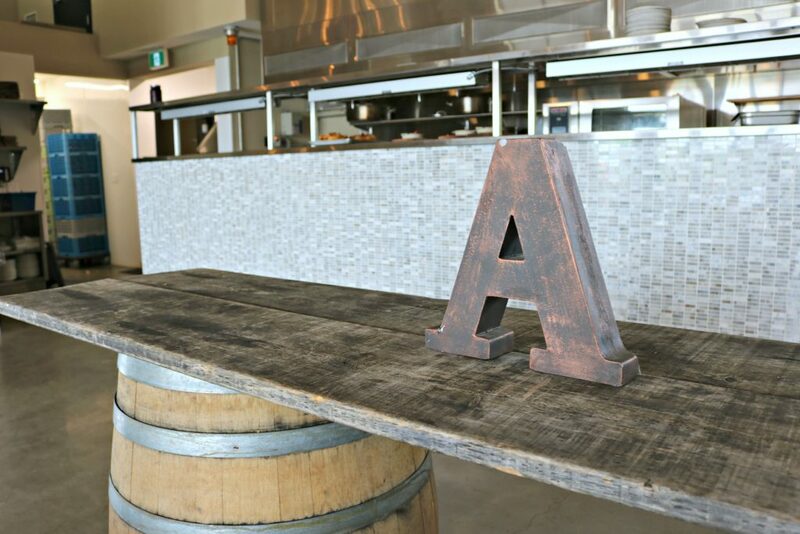 Adamo Estate Winery caters and has a kitchen, you can see it where the A is pictured. 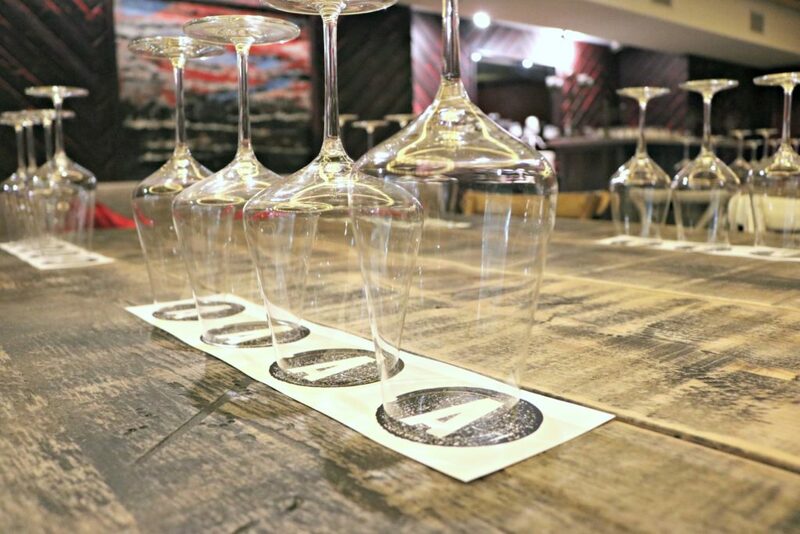 They have another hall in the basement (the Cellar Room) where you can have wine tastings with larger groups. You can even see where they age their cheese and meats that are used throughout their resort. 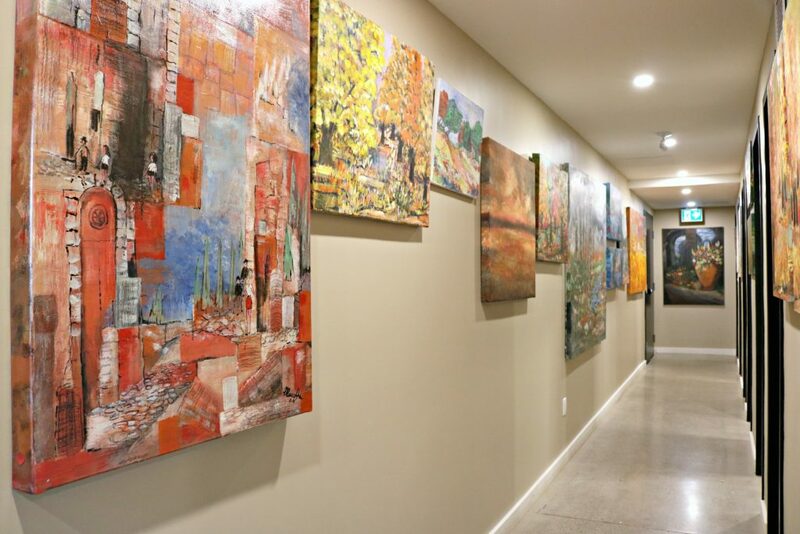 Throughout the winery, you can see original artwork from Mr. Adamo himself. 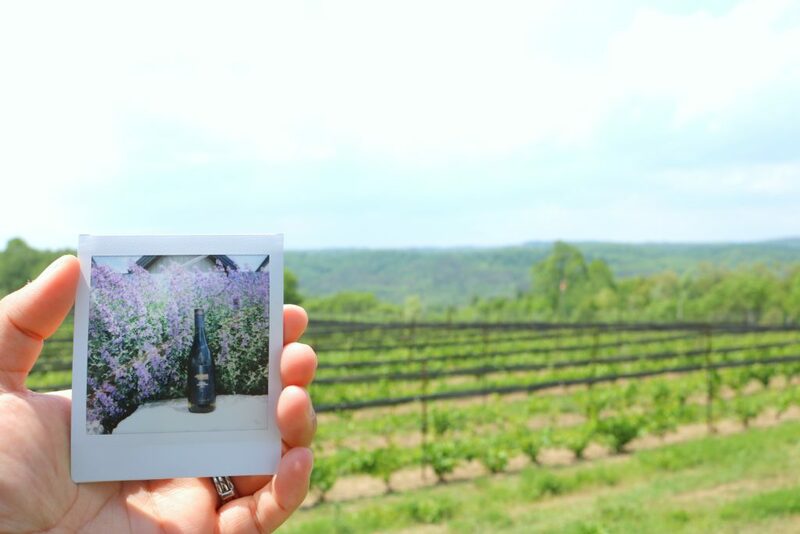 It was great to learn about the history of the winery and why Mr. Adamo chose the location. The rolling hills reminded him of his home in Italy. 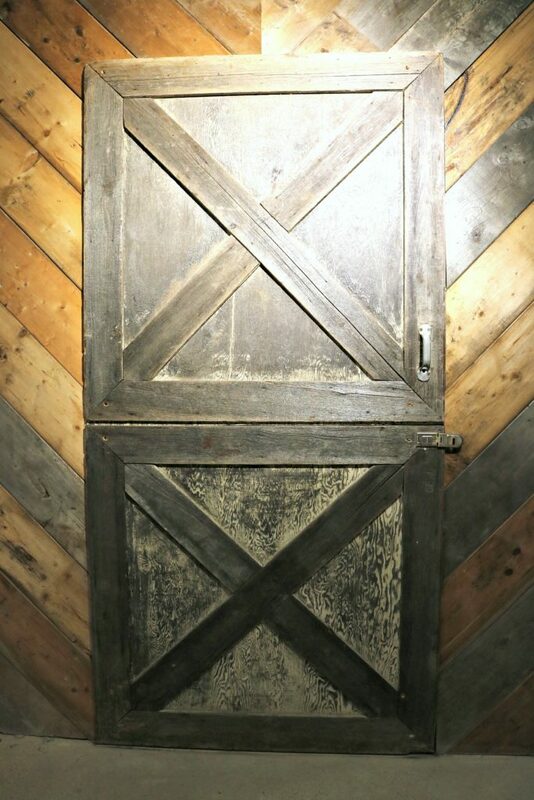 A cool piece of decor was the original barn door from the barn where it is all began. 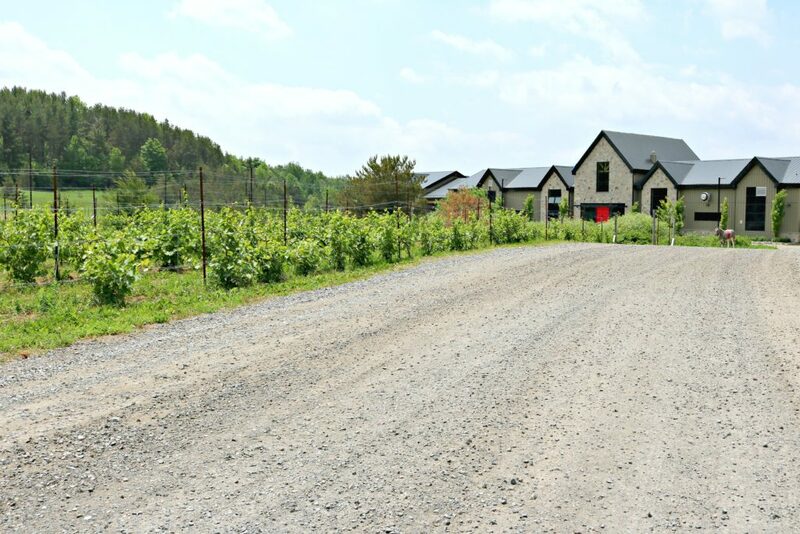 The new winery now sits where the barn used to be! Tasting wine and learning about them right from the winemaker was such a treat. Though I must say, all of the workers there know their wines. Shauna gave us flights from light-bodied to heavy-bodied, ice-wine to a hybrid. 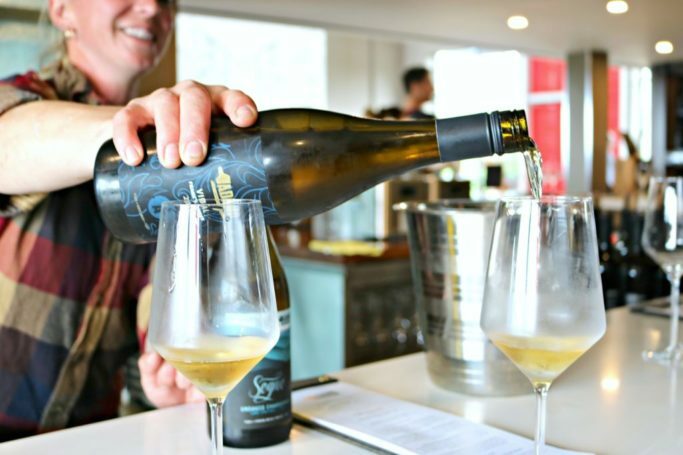 We sampled Lepp David’s Vineyard Riesling, Red Head, Whip’d Red Blend and Muscat dessert wine. Check out my slideshow above to see the wines! 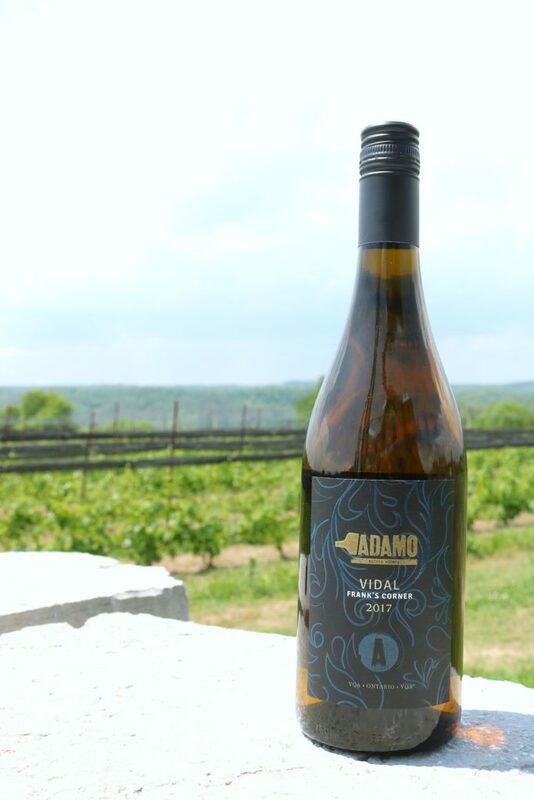 TIP: Come down to the Adamo Estate Winery to try ‘winery direct’ wines & take some home with you. 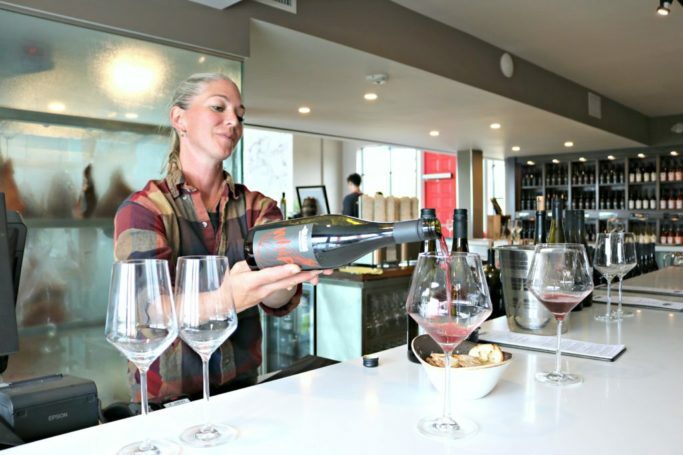 The rest of the wines you can buy online. One of my favourites was the Vidal, I took a bottle home since it was so unique! They let the grapes hang into November and picked on a day when it was -10 degrees out. With the cold harvest, the colour is very similar to icewine and so is the style, without being too sickly sweet. You can only get this directly from the winery. 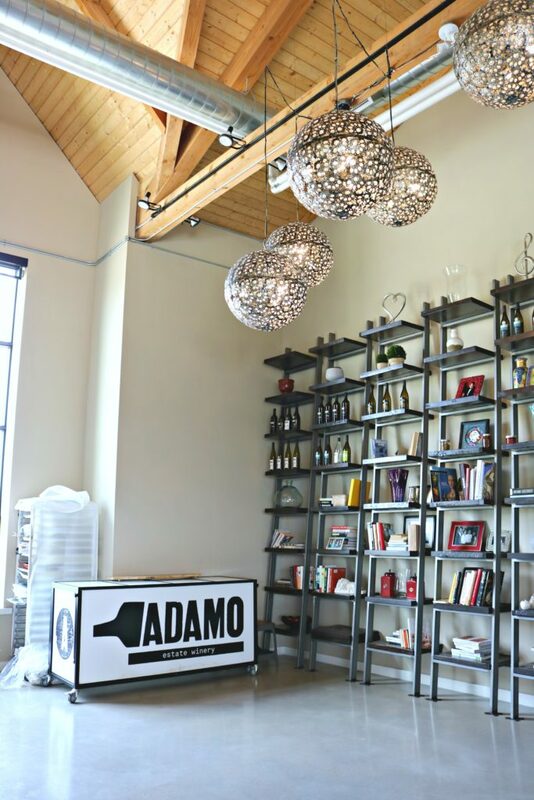 On Friday nights the Adamo Estate Winery host a Wine & Unwind event. 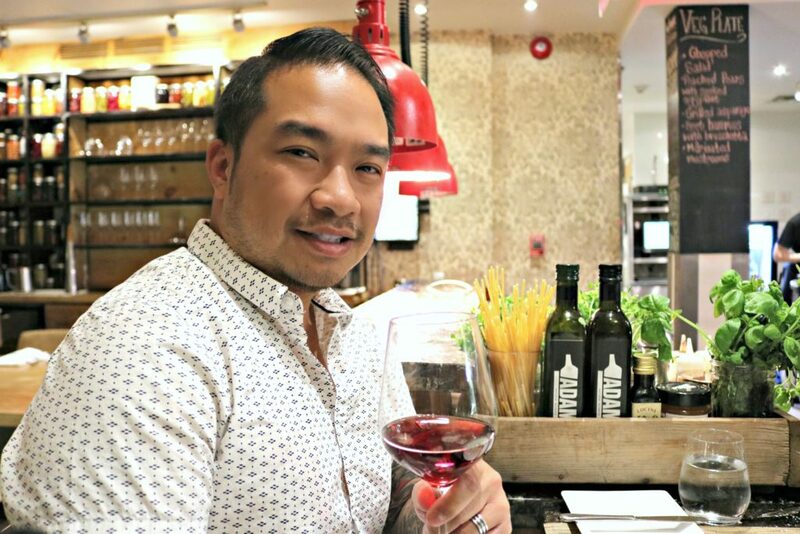 Featuring live music, seafood, shared plates and fine wine! Get more info, here. The experience was exactly what we needed. After a couple days, we were refreshed, recharged and ready to finish off the rest of the week. Since this gorgeous oasis is so close, we can really make this a regular thing. It’s a perfect escape for couples or a girls’ getaway. 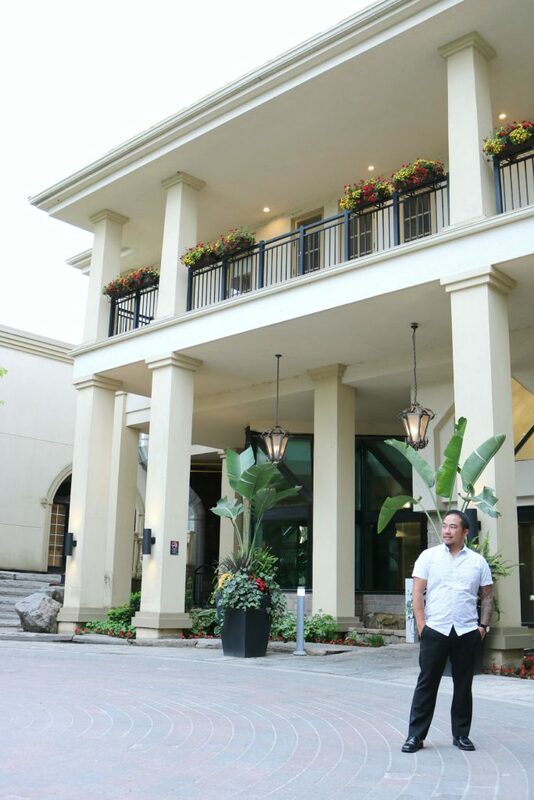 You really can’t go wrong at Hockley Valley Resort with comfy digs, amazing food, and impeccable wine, right? Summer is still going strong, so you have plenty of time to book a couple days off during the week to get here! From now until August 31st, they have a mid-week special. Why not save a little and have a great time? For more information, visit hockley.com. Follow them on Instagram, Facebook, and Twitter. Their pics are totally going to make you want to visit even more. I know I see them in my feed and want to go back! Do you ever get away during the week? Previous Post: « Self-Care is Important: Take the Self-Care Day Challenge + Giveaway! Hockley Valley Resort is beautiful! I couldn’t stop eyeing the food, though. Now I’m a little hungry. Great photos! Thank you so much! Yes, their food is amazing. 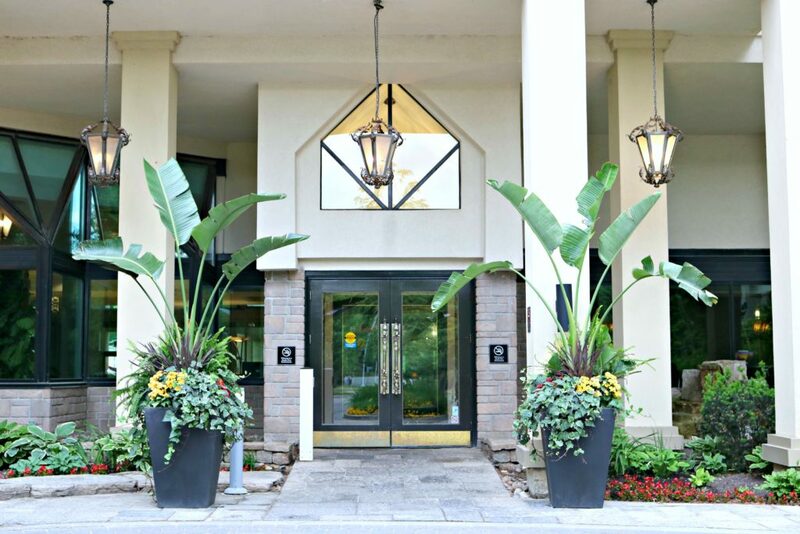 The landscaping is gorgeous and I love all the flowers on the balconies. And those food photos are making me hungry. I’d love to visit and take advantage of the spa. Yes, they have really set it up as an oasis. It really is beautiful. This looks so luxurious. I will have to add this place to my “to visit” list because it looks amazing! Woot, awesome! Hope you enjoy your stay. I need to pack my suitcase and sneak away to hear as it looks like the perfect place to relax. 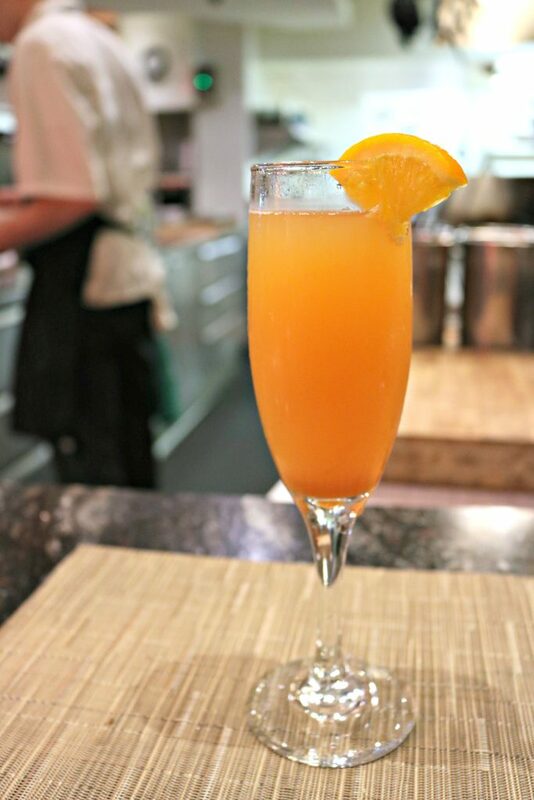 This looks like the cure for summer dining and pampering. I have not been to a winery lately so this would be a great way to kick back and the grounds looked amazing. 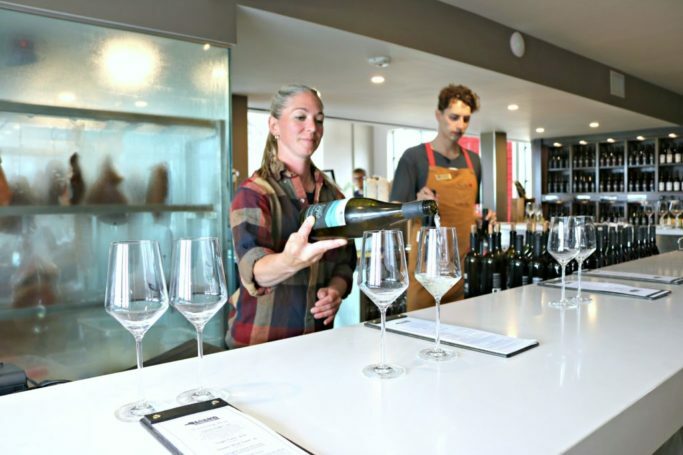 Yes, it is the perfect time to go for a tour and enjoy some wine. WOW! This resort looks beyond amazing. 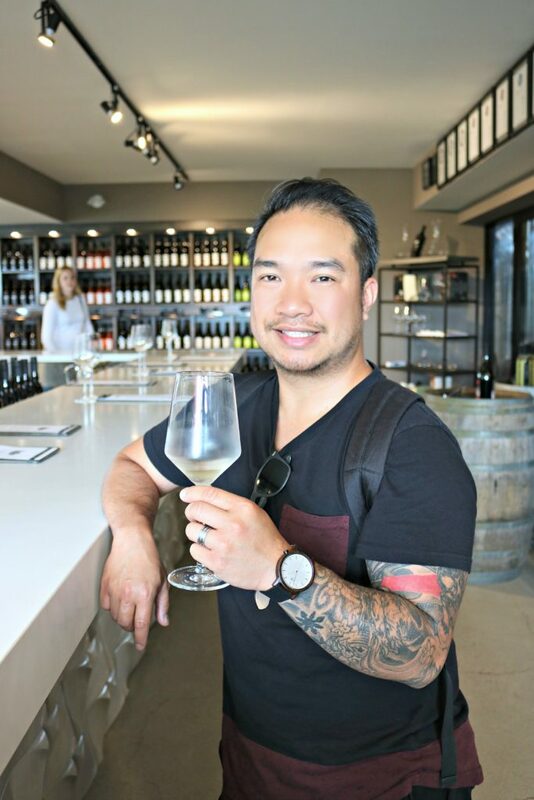 And that winery looks amazing! But I think what really caught my eye is the food. All those dishes look so tasty! 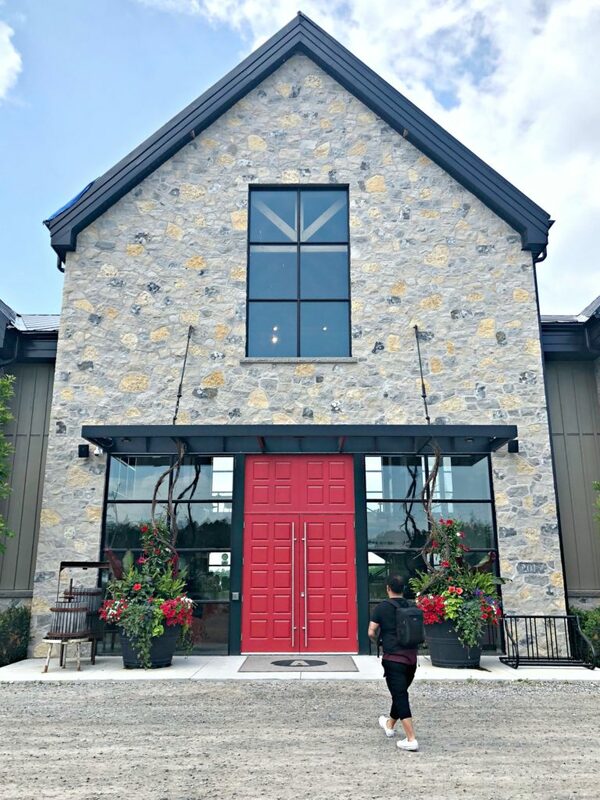 Yes, the winery was one of my fave parts and the food is amazing. I do love a good buffet breakfast. And that room sounds like a comfortable place to relax with a nice view from the balcony. Yes, it was really nice to get a good night’s sleep. Yes, I need this resort, even if just for a few days. Just seeing the front doors make my stress melt away! Yessss, it is so relaxing. We all need that. It looks very peaceful there and we could all use more of that. And that food? Yum! I want to visit. Yes, we can all use more relaxation. I love getting away mid-week when I can. This resort is stunning! I love every detail about it. Would love to visit one day. Me too, it is nice to recharge. This looks like such a relaxing place to visit. I’m all for taking random trips. Oh my goodness this seems like such an amazing place to go and stay! Sadly it is too far for a midweek break for me, but I would totally plan a holiday in the area! It looks so relaxing. Aww, hopefully you can make it out regardless for a holiday. Wow, this looks like a great place to just get away from it all! I love the views, the pool, the food, I want to go! What a beautiful place to stay! I hope to go here with my husband one day. We could use a place to relax at. This resort sounds like paradise! I would love to visit to get away from the everyday grind at home. I totally crave a relaxation trip every few months! Yes, it is so necessary. What a wonderful place to runaway to if you need to relax and rest and just take it slow for once! I think the view is fab and the food is even better. Thanks for sharing your experience with us! I’m hoping we can escape to this place someday soon! My pleasure, hope you can make it! Wow that looks awesome. I will def have to out on my list of go to places. Hopefully later this year. Awesome, it is beautiful any time of the year! WOW!!! What a hotel!! 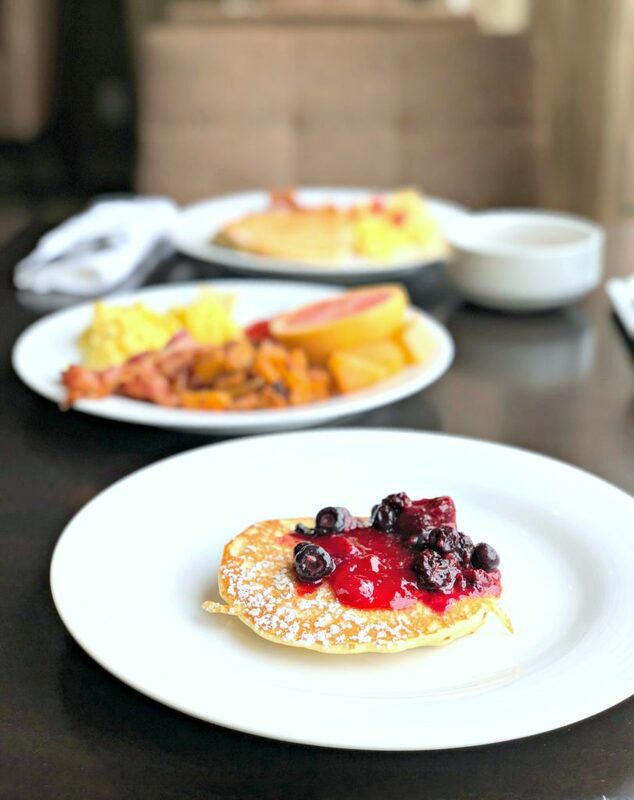 Look at that food too, I always judge a hotel on the quality of the food and looks utterly delicious! I’d love to be sat by the pool right now! Hehe, yes! The food is big for us when we travel too. You’ve convinced me. This all looks amazing and somewhere that we would love to visit and stay! I hope you can! You would love it. That looks like such a relaxing and fun getaway! The rooms are gorgeous, and that bed looks so plush! The food all looks yummy, too! I really need a vacation! It really is nice to get away, maybe it is time Nikki! Handsome man you have there Nancy.This looks like a beautiful spot to stay,food looks amazing! Why thank you Kathy! He is a great man, I am lucky. Yes, Hockley is absolutely gorgeous, we cannot wait to go back. Your welcome and I will be adding this place to my bucket list ! What a fun getaway! I love spas, especially if I can have some wine while I’m getting my pedi 🙂 This place looks amazing, wish I lived close by, I would totally plan a day trip! Yes, it does not get any better than that! Wish you did, maybe when you head this way. This resort is so beautiful. It has that calming and relaxing atmosphere. Love your photography! Thank you very much! Yes, we did have a great time. What a nice place to relax and unwind from a busy week. A weekend staycation for me is so long overdue. Yes, it really is nice to get away. If it is not possible to get away during the weekend, mid-week works perfect! I think these are more than enough reasons to go there! I love the place and it’s totally relaxing. It’s the place you’d go to if you’ve had too much of the city and you need a break. Yes, you are so right! It is such a beautiful place. This looks like the perfect mid-week break that I need in my life! I need to look into booking a trip! Yes, you would love it. It makes for a great getaway! This looks like a great resort to visit! I love visiting different resorts and seeing the different housing styles and foods they have. Yay, I hope you enjoy it when you go! 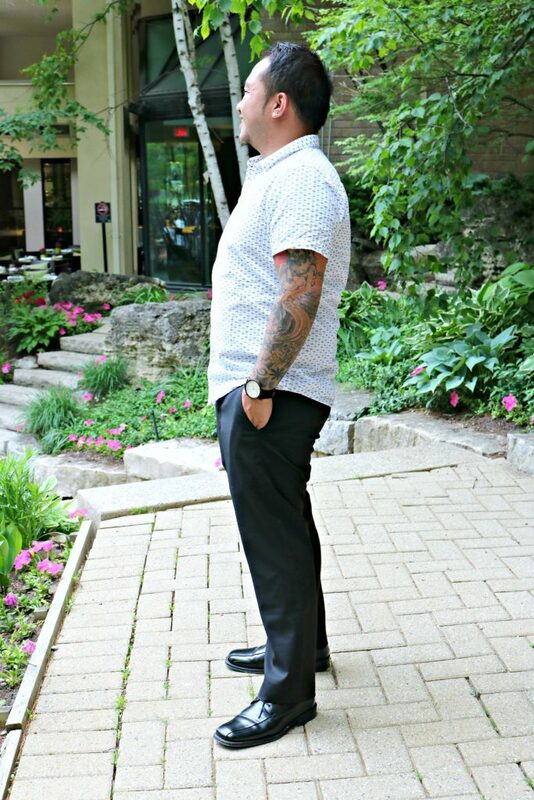 Clearly your hubby is loving Hockley Valley Resort!! haha. I have never heard of it before now & wow, really incredible! Loving everything about it!